PhilTonks2: Getting Better Buses - and sometimes not! But inevitably I did start thinking. 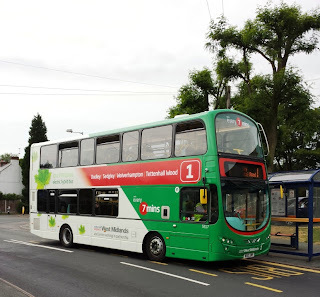 As I glided, sometimes silently, trolleybus style, across the Black Country, I thought about how much things have really improved for regular users of this and other routes in the West Midlands over recent years. Change can be unnerving, especially when it comes to bus services. In the last 5 years, we bus users in Centro-land have seen a huge change to what is on offer. "Network Reviews" have seen many routes changed, revised or renumbered (and I'm still fairly breathless trying to catch up!) - the bus user of 5+ years ago would see a significantly different network today. We've also seen improvements that, whilst not always immediately evident, are most definitely there. Brand spanking new bus stations in Wolverhampton and Stourbridge, lots of new shelters, and lots of new and refurbished buses. It's easy to be critical about a bus service, and sometimes if you use a service day in, day out, a regular problem can grind you down. But for users of route 1, they can have no complaints, certainly about the quality of the vehicles - these are a step change to what previously plied the route. Before I get carried away with too positive thoughts, however, I am brought crashing back down to earth at the Tettenhall Wood end of the service. Route 1 turns around at a mini-roundabout deep inside a housing estate, where the 7 minute NX frequency, with it's clean, green machines are joined by something of a quite different nature - the services of Travel Express, who compete between here and Wolverhampton City Centre, as "Handyrider". If the business mantra is "competition is good", I decide to find out what the rival offering provides. Travel Express offers a 15 minute service compared to NX's 7 minute daytime frequency. It only runs as far as the City Centre (as the previous incarnation, the 501 route did, prior to the Wolverhampton Network Review). No hybrid clean green machines on offer here - indeed some are H-registered single deckers that, in their faded cream and red livery aren't too pleasing on the eye. I observe the scene for a while. NX's hybrid deckers routinely spin the mini-roundabout and begin their run back towards the City and on to Dudley. Travel Express's offerings are also running to time on this Saturday afternoon. It is clear that the majority of non-concessionary pass holders have an NX Travelcard as they ignore the older Travel Express single deckers and go for the big green offering. Those with concessionary passes are more open to Travel Express though, should one of their buses be on the stop. So it is with slight bemusement to the NX driver and fellow intending passenger that I let the Hybrid vehicle go and await the rival service, which is negotiating the aforementioned mini-roundabout. Even more bemused seems the driver, who like his colleagues, doesn't wear a uniform, but a green hi-viz instead. "How much to Town, please?" I enquire. £2 is the response. He even addresses me a "Sir". But that appears to be the only advantage over the National Express offering. £2 is exactly the same fare as the clean, green machines. So there's no monetary value in using the competition (although maybe a weekly offering is cheaper), and the experience is distinctly below average. 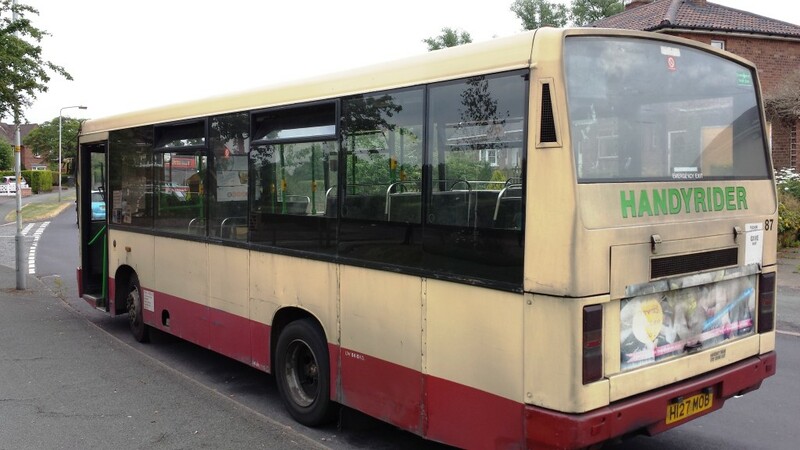 To be fair, the driving skills are good, but the bus itself has seen far better days. I sit at the back, with the engine resembling a farmyard tractor. This is "back to basics" in every sense. The floor needs to see a mop and the windows haven't seen anything wet for a while, either. We depart 2 minutes early. Passing various intending passengers along Tettenhall Road towards the City, most of them step back. As previously noted, the only taker is an elderly gentleman in a suit, who can choose his operator. We are the only 2 passengers along the whole of the route, and we alight outside the Grand Theatre. Our driver disappears with a strained growl of the tractor engine in search of more custom. Travel Express has more routes in Wolverhampton, all competing with National Express West Midlands. In the bus station, it is all the more evident, as a large investment in new vehicles in recent times by NX simply shows up the competition even more. But I muse more on this as I await my 256 homeward. The smaller operator must make a living out of this. I see several of their vehicles loading in the bus station, but many are elderly. I guess to many users, a bus is a bus is a bus. Especially if you have the freedom to use the first one to come along. Stagecoach make an interesting comparison with their MagicBus services, serving student accommodation in Manchester. Yes, you can catch "regular" Stagecoach buses along the Wilmslow Road, but the cheaper Magicbuses, with their elderly vehicles are a no-frills alternative that students lap up. I've stood there watching how these services are used and it is fascinating. But I'm struggling to understand any similarity in Wolverhampton along Tettenhall Road with Travel Express. On route 1 we have the two extremes of bus operation: posh environmentally-friendly buses (with stops announced visually and audibly - by a NX Manager with classic Black Country accent!) compared to just about as no-frills as you can get. And for a single journey it costs exactly the same. I guess advocates of Quality Contracts will tell me that the "no-frills" operation would disappear under a QC, but whilst competition in the bus industry on the road can be interesting to various degrees (I'm thinking more a battle of "quality"), I ponder the image such "basic" service providers give to the wider public - especially the non-regular users we're all trying to attract. The free market can bring us better buses - and sometimes not!